Vincent KHV-111MK in silver and black finish. Click to open large high res images. 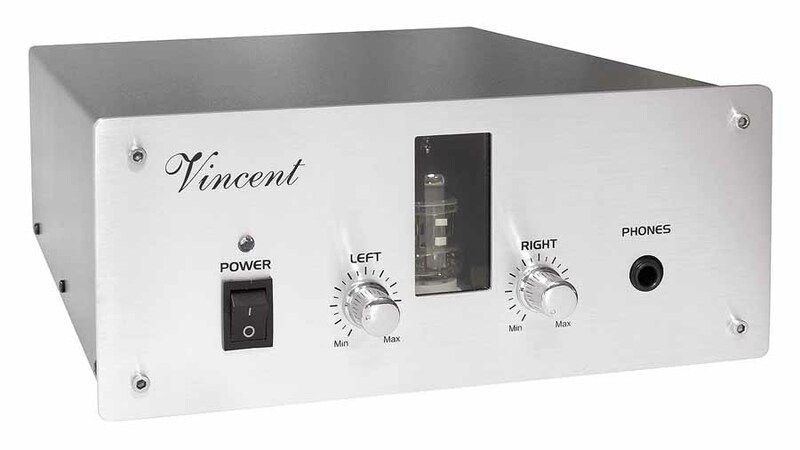 GRAND RAPIDS, MI (6/17/10) – Vincent Audio has introduced a high-quality headphone amplifier that uses a hybrid of vacuum tube and solid-state circuitry to enable serious headphone listeners to get the most pleasure out of their music. The Vincent Audio KHV-111MK headphone amplifier combines premium solid-state discrete component circuitry with a classic 12AX7 vacuum tube input stage that is ideally matched to the headphone use. The 12AX7 is a two-channel, pure Class A triode vacuum tube noted for its high gain, accuracy and musical character. With the higher operating voltages of vacuum tubes, and the different requirements of the solid-state sections, Vincent Audio gave the KHV-111MK a very large and stable power supply section. With the combined weight of the power supply combined with the heavy-duty chassis used to shield the sensitive circuitry, the KHV-111MK weighs in at a hefty 7 pounds, well above that of most headphone amplifiers. The Vincent KHV-111MK has separate, front-panel volume controls for the left and right channels, a front 1/4-inch headphone jack, power switch, and a window to monitor the glow of the vacuum tube filament. The rear-panel has gold-plated stereo RCA input jacks. The Vincent KHV-111MK is currently available in black or silver finish, and with a suggested retail price of $499.95. Vincent Audio manufactures high-end audio components that use vacuum tube and hybrid tube/solid-state technology to produce sound that is powerful, accurate, and texturally satisfying. The brand's exclusive North American distributor is WS Distributing, LLC, of Grand Rapids, Michigan. For more information about Vincent Audio, visit WS Distributing's web site at www.wsdistributing.com. Dimensions (WxHxD): 8.5" x 3.75" x 12"